You haven't experienced a luxury picnic until you've sat down on the green grass of the Fairlawns Boutique Hotel & Spa. Here's our review of hanging out, with a picnic basket and Champagne. Whether you’re into Perrier Jouët champagne or Scotch whisky old enough to order it’s own Scotch, it’s always fun to hang out poolside under an umbrella with a picnic basket and a good drink or three. 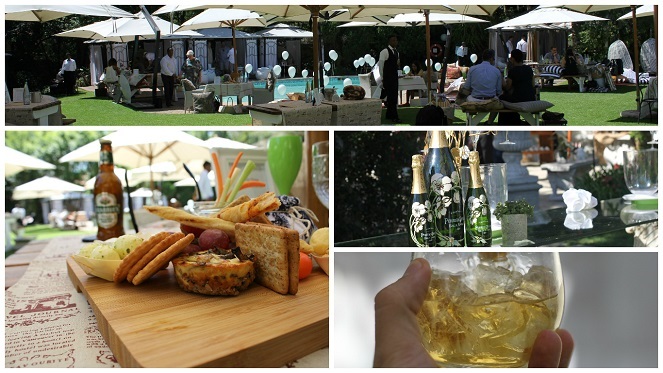 We recently went for such an affair at the Fairlawns Boutique Hotel in Sandton. It is by far one of the most beautiful venues we’ve been to in a long time. The hotel went through a massive revamp and is looking stunning — it deserves to be called Fairlawns. Previously a luxury private residence, it is only fitting that the property has transformed itself into the stylish hotel, with an air of eclectic sophistication that Fairlawns is today. With close attention to detail and great service, this hotel creates an intimate atmosphere which forms the building blocks of a successful picnic. The hotel also caters to a variety of culinary tastes with an array of elegant dining experiences to choose from. Phone ahead of time and ask that they arrange a picnic basket for you. Or just order from the restaurant’s menu, grab a bench and enjoy the tranquillity.